This morning I awoke so very tired and yet so very thankful for the great success of our Student Leadership Conference. It was a incredible week, and based on many conversations with teenagers and adult leaders, we’ll see many of them next year (save the dates July 10-13). I “called-in” several friendship favors (to keep the costs down) as our year 1 @ APU was really a year of R & D (research/development) and low price offering so we could help youth groups during this difficult economy (only $99 for 4 days). Thankfully the low cost and my “I will serve for free” friends helped us minister to and challenge 450+ people from all over the country. 1. Doug Franklin & his amazing team a LeaderTreks for providing some very creative leadership experiences. 2. 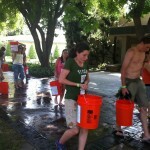 World Vision for a life-changing Water-walk experience that gave our young leaders a global perspective. 3. Jim Burns & the team at HomeWord for an amazing picture of discipleship & legacy. 4. Taffy & the incredible student band (Taffy is one of the best youth workers/disciplers thru music I’ve ever seen). 5. My podcast partners for teaching workshops–Matt McGill, Josh Griffin, & Katie Edwards. 6. UFC fighter & Christ-follower Mark Munoz for his message on perseverance. 7. Author, Men’s Ministry guru Kenny Luck who delivered a most-amazing closing session. 8. David Peck (Assoc. VP @ APU) who had the vision to host this event. 9. SYM/Group for graciously paying for our notebook. 10.Dear friend & incredible communicator/youth worker/author Megan Hutchinson for speaking. 11.Several gracious youth workers who brought students and also taught workshops: Rory, Danny, Michelle, Freddy, & Andrea. 12.Jeff Maguire & Neely McQueen for jumping-in and adding your life, creativity & humor to this event. 14.The Kern Center & Steve Quatro‘s leadership for providing funds to resource & care for the adult leaders. 15.Long-time youth worker and NNYM guru in southern CA–Mike DeVito poured into the life of leaders all week & reminded us we’re better together. 16. Jana Sarti’s amazing leadership/vision who worked so hard for so many months to make this happen–she’s an amazing and godly-leader! Obviously we’d love to have you and your group consider joining us next year. We know some things about next year: (1) the dates–July 10-13, (2) it will be in Southern California (and we’re exploring a 2nd option on the east coast), (3) it won’t be only $99…but, we’ll make it very inexpensive–the earlier you sign up the cheaper it will be, (4) we’ve already started to think about pray about next year’s program, (5) It will sell-out! Start praying about it and consider if it might be right for some of your leaders (and potential leaders). To the groups who came this year: thanks for trusting us with your incredible kids! Question: What did you do for developing student leaders this summer?